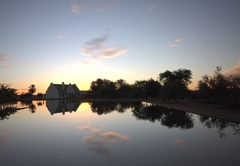 Dundi Lodge Augrabies Falls is a highly recommended Augrabies hotel providing accommodation in 11 guest rooms for tourists visiting the Green Kalahari region. 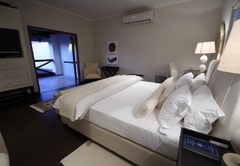 Luxurious en-suite accommodation, sherry on arrival, tea, coffees, biscuits in room, air conditioning, heating, DSTV (satellite TV) with LCD screens and WiFi connection. 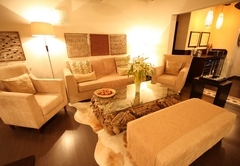 Suite 1 has a private lounge, study and large private patio named the Dundi Presidential Suite. 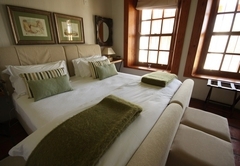 Rooms 9, 10 and 11 are situated in the Manor house which can be booked either as a whole unit or per room. 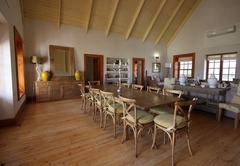 The Manor House consist of a large living area with lounge, twelve seater dining table and large kitchen with gas stove. The living room contain a fireplace and in the main bedroom, number 9. The Manor House is ideal for a family or a small group of six. 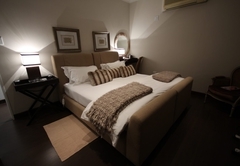 Suite 8 has an extra room with to single beds and bathroom is ideal for a family of four. 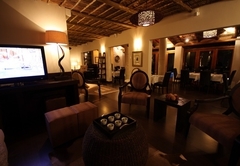 The décor in the lodge has been acclaimed by all as being exceptional and unique. 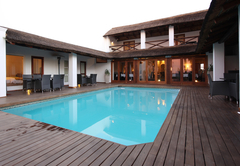 As far as the décor is concerned, Dundi Lodge is a real “lady in the bush”. Wood and crystal subtly blend with authentic African culture. The interior of Dundi gives one a contemporary ethnic feel. Each piece is handpicked and the special attention to detail has given Dundi Lodge its unique contemporary ethnic feel. Each room is individually furnished in a different style and each room has a décor style, which reflects in each of the units. Dine in an intimate dinning area, enjoy starlight boma dinners, with traditional potjiekos and other Gourmet dishes and be entertained by our well trained staff. 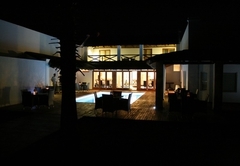 The main deck overlooks the swimming pool while listening to the nightly antics. Situated superbly close to Augrabies Falls and the best game viewing areas in the region, our privately owned Game Reserve is only 55km from us. Our Game Reserve hugs the banks of the scenic Orange River, and has magnificent views of the overhanging cliffs, where the antics of the resident baboon troop entertain guests. 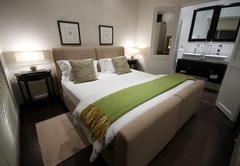 Spacious en-suite bedroom with King-size bed, lounge, balcony access. 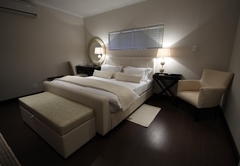 Luxurious en-suite accommodation, sherry on arrival, tea, coffees, biscuits in room, air conditioning, heating, DSTV (satellite TV) with LCD screens and WiFi connection. More spacious than standard luxury suites. 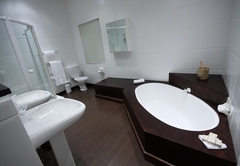 Rooms equipped with bath and shower. 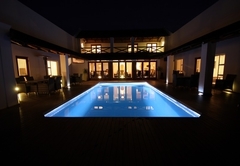 Luxurious en-suite accommodation, sherry on arrival, tea, coffees, biscuits in room, air conditioning, heating, DSTV (satellite TV) with LCD screens and WiFi connection. Graciously restored with 3 en-suite bedrooms, open plan dining/living area. DSTV. Situated in the Dundi Lodge precinct. Sleeping max 6 guests. Exclusive-use only. 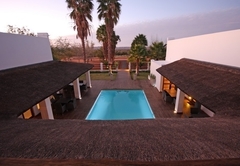 Luxurious en-suite accommodation, sherry on arrival, tea, coffees, biscuits in room, air conditioning, heating, DSTV (satellite TV) with LCD screens and Wi-Fi connection. Response timeDundi Lodge Augrabies Falls typically responds to requests in 5-10 minutes.